Hot chocolate? Brownie? Cupcake? You can have all three in one yummy treat! And, believe it or not, there's even a chocolate chip cookie garnish. Prepare brownie batter as directed on package; spoon into cups. Bake 15 to 18 min. or until toothpick inserted in centers comes out with fudgy crumbs. (Do not overbake.) Cool in pans 10 min. Remove from pans to wire racks; cool completely. Beat cream cheese, marshmallow creme and vanilla in large bowl with mixer until blended. Add COOL WHIP and cocoa powder; beat just until blended. 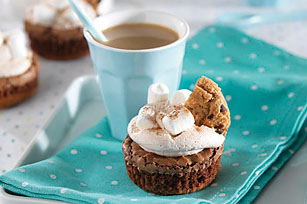 Spread onto cupcakes; top with marshmallows. Cut each of the remaining cookies into 4 pieces. Insert 1 cookie piece into top of each cupcake just before serving. Spoon frosting into pastry bag fitted with decorating tip. (Or, spoon frosting into resealable plastic bag. Cut off small corner from bottom of bag.) Pipe frosting onto cupcakes. For variety, omit cocoa powder and marshmallows. Sprinkle frosted cupcakes with chocolate or multi-colored sprinkles, colored sugar or nonpareils. Prepare using 1/2 cup (1/2 of 8-oz. tub) PHILADELPHIA Cream Cheese Spread. Dust with additional cocoa powder just before serving.